Join the anthology for AltCom 2018: HOW TO SURVIVE A DICTATORSHIP! Send us comics about your thoughts, experiences, strategy tips and tricks on the subject. As always in AltCom, we will hand the book out for free during and after the festival. If you are unsure what we mean by “high-resolution” or “bleed”, please ask. Lots of artists don’t know, and it’s better to ask than to send us files that we can’t use. Please help share this invitation to anyone who might be interested! Here’s the Facebook event. As usual, no one gets paid for participating. But on the other hand, no one pays to get it either. Everything is voluntary. AltCom 2018 will take place August 23-26, in Malmö, Sweden (venues & program will be released during the coming months), with exhibitions, international guests, a comics fair, etc. This year we combine the comics festival with the TRAUMA noise festival. 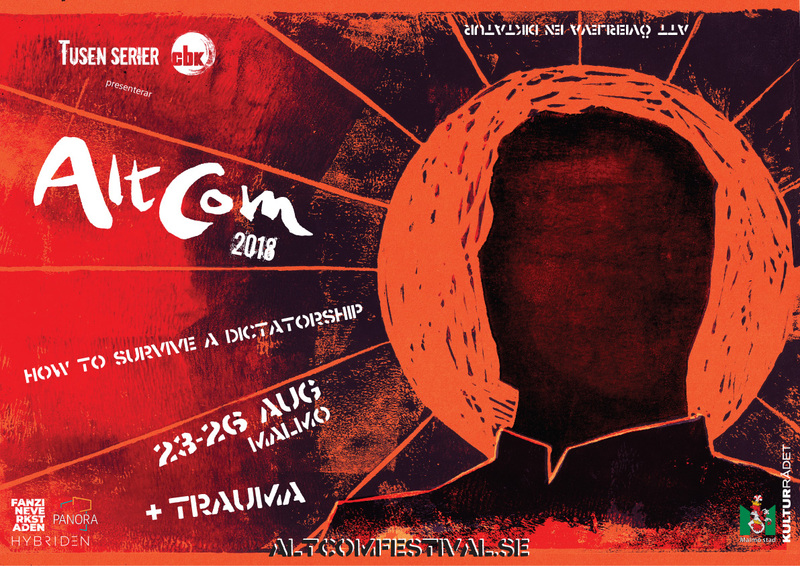 AltCom 2018 is organised by Tusen Serier in collaboration with CBK, Wormgod, Panora, Noise Against Fascism etc, with support from Malmö Kulturstöd & Kulturrådet.